Total knee replacement is an excellent operation for advanced knee arthritis when the nonoperative measures are no longer effective. Knee replacement improves the patient’s quality of life by relieving pain, improving movement and improved activity levels. Millions of knee replacement operations have been performed worldwide in the last four decades with great success. Current knee replacement procedures expected to function well for 10 to 20 years in 90 percent of patients. However some of the knee replacements may not last forever and may fail over a period of time and require a revision knee replacement surgery. Revision knee replacement surgery is a complex procedure. A thorough pre-operative planning combined with experience in using specialised implants and instruments and expertise in difficult surgical techniques is essential to achieve a successful outcome after revision knee replacement. 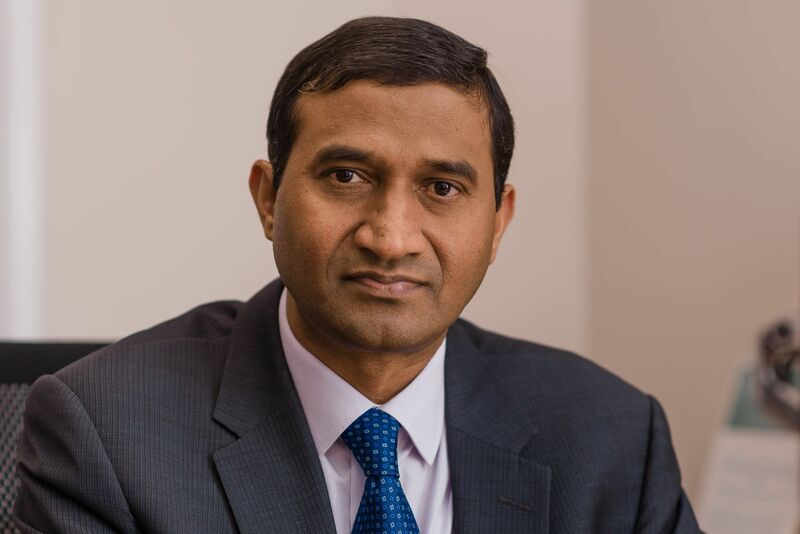 Mr Samsani is the lead revision knee and hip surgeon at Medway hospital with extensive experience in revision knee replacement surgery and has been performing these procedures since his appointment as a substantive Consultant Orthopaedic Surgeon at Medway NHS Foundation Trust, Gillingham England in 2006. NEXT: WHAT IS IT? JUMP TO: WHY DO THEY FAIL? Some knee replacements may fail over a period of time and may require revision surgery to relieve pain and improve the function. Revision knee replacement surgery is a complex procedure in which the surgeon removes a failed previously implanted knee replacement prosthesis and replaces with a new prosthesis. It requires meticulous preoperative planning, expertise in using specialised implants and instruments and experience in difficult surgical techniques to achieve a successful outcome. It may also require the use of bone graft from bank. Why does the artificial knee replacement fail? Modern knee replacement is a very successful operation and the majority of them function well for the rest of the patient’s life. They are expected to function for at least 10 to 20 years in 90 percent of patients. Some patient related factors are associates with increased risk of failure. Young and active patients have an increased risk of failure and therefore high rate of revision. Patients with excessive body weight also have increased risk of failure due to wear and loosening of implant. Also patients with rheumatoid arthritis or other inflammatory arthropathies, avascular necrosis are also at increased risk of failure and therefore revision. Loosening: Artificial knee joint can become loose for several reasons. Commonly it happens due to the small particles generated from the artificial joint over period of time that accumulate around the joint. These particles generate an inflammatory response which can, over a period of time, cause destruction of surrounding bone that may result in loosening of the prosthesis. Occasionally loosening of a knee replacement can also occur due to mechanical reasons such as excessive weight. This type of loosening is called aseptic loosening and is the most common cause of failure of an artificial knee joint. When the artificial knee joint becomes loose, patient may experience pain, instability and deterioration of knee function. Infection: Infection is an uncommon cause of failure of a knee replacement. The infection can occur immediately after operation or some time later. The bacteria attach to the surface of the metal implants and may not respond to the antibiotics. The infection causes persistent pain, swelling, stiffness and drainage from the knee joint. The infected knee replacements are usually treated with two stage revision surgery. First stage involves removal of infected knee replacement prosthesis, cleaning of the joint and placement of an antibiotic loaded spacer. Second stage is performed when the infection is cleared from the joint which involves re-implantation of the new knee prosthesis. Dislocation or Subluxation: Dislocation means sudden popping out or migration of knee implant from its normal position. This type of failure is uncommon with knee replacement and may happen due to the wear of the insert after prolonged periods of usage of artificial knee. Instability: Instability of artificial knee joint is another cause of failure of the knee replacement. Instability can occur due to laxity of the soft tissues, wear of polyethylene insert or loosening of prosthesis. Instability causes pain, swelling and deterioration of knee function and may require revision surgery. Other causes: Wrong position, incorrect rotation of the prosthesis can cause pain and stiffness and may necessitate a revision surgery. What are the benefits of revision knee surgery? Unlike the primary (first time) total knee replacement, revision knee replacement is a major surgery and requires complex surgical techniques. Risk of complications is higher when compared to primary knee replacement and also some patients may not be fit to undergo the complex revision surgery. Therefore it is important to carefully consider the risks and benefits of the operation before surgery. The knee replacement helps to relieves pain and improves the range of movement and function in the knee for long period after the operation. Increasing pain or return of pain in a previously painless knee replacement, stiffness and loss of function maybe the early signs of a failing knee replacement and should be reviewed by the orthopaedic surgeon as soon as possible for further assessment. A detailed assessment including clinical evaluation, x-rays, blood tests and scans is performed to establish the cause of the failure of the knee replacement. Discomfort around the knee cap is not uncommon after total knee replacement and presence of this symptom alone does not warrant any revision surgery. Orthopaedic evaluation: Detailed history and clinical examination is performed to assess the location and severity of pain and degree of stiffness. Signs of infection such as swelling, redness and warmth are recorded. Information on deteriorating knee function is also obtained. Presence of any deformity is also noted. X-rays of the knee joint are performed to see any change in position of prosthesis, areas of loss of bone around the knee, detect signs of loosening or infection. Mechanical failure with broken implants or excessive wear is also detected. Comparison with previous x-rays is important to detect early signs of failure. Blood tests including full blood count, ESR and CRP are routinely performed to detect any infection in the knee replacement. Further tests such as aspiration of knee joint with or without arthroscopic synovial biopsy, CT scan, bone scans may be required to detect any infection, loosening or component malposition. The main aim of the preoperative assessment procedure is to make sure that you are fit for revision knee replacement surgery and recover well after operation. As a part of this you may have a general medical examination and undergo few tests. Medical examination: You may be reviewed by a medical specialist to make sure your general health is in satisfactory condition to undergo revision knee replacement and complete recovery after the operation. You may also be seen by a specialist medical doctor such as a Cardiologist or Nephrologist if you have chronic medical problems such as angina, kidney problems. Tests: Routine blood and urine tests and an ECG may be carried out. A chest x-ray may be needed. Medication: Inform Mr Samsani or his team about all the medicines you are taking. Please carry a list of your medicines with you including the name, dosage, and how often you take it. Mr Samsani or his team will advise you which medicine you should stop or can continue taking before surgery. Preparing your skin: Presence of an infection in the body at the time of operation markedly increases the risk of wound infection. Make sure that you do not have any infection either on the leg or anywhere else on your body before surgery. Contact Mr Samsani or his team if you notice any infection and get it treated before the operation. Dental evaluation: If you suffer from any dental problems or diseases, you should get it treated before knee replacement operation. Dental procedures (dental extractions, periodontal work) release bacteria into the blood steam which increases the risk of wound infection. Urinary problems: People with history of urinary infections may require urological assessment to rule out any ongoing urinary infection before surgery. Severe prostate conditions may have to be treated before revision knee replacement surgery. Weight loss: Being overweight may increase the risk of complications during surgery. It may also reduce the lifespan of the revision total knee prosthesis. Therefore Mr Samsani or his team may advise you to lose some weight before the operation to reduce the risk of complications. Blood donations: Some blood loss can occur during or after knee replacement surgery and you may need blood transfusion to after the operation. Therefore Mr Samsani or his team may ask you to donate your own blood before operation. This will be stored in the blood bank in case you need it after surgery. Help from family and friends: After revision knee replacement surgery you will be walking with the help of crutches or a frame. However you will benefit from some help for several weeks with day to day activities such as cooking, bathing, shopping and laundry. Home planning: Some home modifications are required to make your home return easier during your recovery from revision knee replacement surgery. Following are the list of home modifications that can make your home easier to navigate after surgery. - Secure handrails along stairways. Revision knee replacement is major and complex operation. as bone graft are available for surgery. also given for postoperative analgesia. implants and reduce the damage to tendons and muscles. prepared and reshaped for fixation of new prosthesis. special metal augments or sleeves or wedges. there is a significant bone loss. may be left alone without any surgical intervention on it. the debris and the wound is then closed in layers. antibiotic loaded spacer and insertion of revision prosthesis. Drains are placed to remove any excessive fluids or blood from the joint. Knee may be splinted in a brace or splint for 6 to weeks to protect the tissues. What happens after revision knee replacement operation? Intra-venous drip attached to a vein of the arm to give fluids, medications and sometimes blood transfusion. A blood pressure cuff around the arm to measure blood pressure regularly. A pulse-oximetre attached to your toe or finger to measure pulse rate and oxygen levels in the blood. A bulky wool and bandage dressing wrapped around the operated knee to cover the wound. Sometimes a drain tube is attached to drain excessive blood from the knee wound. This will be removed in 24 to 48 hours later on the ward. Injections or oral medicine are given to reduce the risk of blood clot formation. Patient is allowed to drink and eat as soon as they feel better. Patient is generally encouraged to drink plenty of fluids to prevent dehydration and also to flush out the anaesthetic medicines from the body. Nausea and vomiting can occur after the operation which usually settles down with time but sometimes medicines are given to control these symptoms. You may sometimes require blood transfusion due to blood loss as result of operation. After the revision knee operation you will have few blood tests to make sure that your haemoglobin and electrolytes in blood are within satisfactory limits. You will also undergo an x-ray of the operated knee to make sure position of the prosthesis is satisfactory. If your haemoglobin is found to be low and having symptoms related to low haemoglobin, you may then require a blood transfusion. After operation, a physiotherapist will visit you in 24 to 48 hours. Physiotherapy can be more intense and prolonged after revision knee replacement. The physiotherapist will teach you how to use the artificial knee and advise about exercises. It is very important to start the exercises early and regularly after the operation to allow quick recovery. Range of movement exercises to improve flexion and extension of the knee joint, and quadriceps strengthening exercises are very important. Normally a range of movement from 0 to 100 degrees of flexion can be expected after revision knee replacement but the ultimate range of movement is mainly dictated by the pre-operative range of movement in the knee. In majority of the cases you will allowed to take full weight through the operated leg immediately after the operation. However in certain complex cases you may be asked to restrict the amount of weight put through the operated leg for a while. - The condition of knee wound is satisfactory. Successful outcome following revision knee replacement depends on how well you follow the instructions given by Mr Samsani and his physiotherapy team. Some amount of pain or discomfort is expected especially in the first few weeks after operation and should be able to be adequately controlled with pain killers. Wound care: Ensure that wound is dry until it is completely healed. You will have stitches or staples running along the wound and these stitches or staples will be removed a few weeks after surgery. You can have a shower once the wound is completely healed and dry. Some swelling and bruising of the knee is common and can take up to a few months for complete improvement. - Driving can be resumed when your knee has achieved sufficient bend to enter and get out of the car comfortably and when you have adequate muscle control in the leg for breaking and acceleration. The majority of patients resume driving at 6 to 13 weeks after surgery. Revision knee surgery is a major and complex procedure and therefore risk of complications is higher compared to the primary total knee replacement. Careful and realistic assessment of the risks is essential before the revision surgery and the decision to proceed with revision knee replacement surgery is made when the benefits of pain relief and improvement in function outweigh the potential serious complication of surgery. Before your operation, Mr Samsani will explain to you (both at the time of consultation as well as before operation), in detail about the possible risks of the surgery and on approximate rehabilitation time. There is always a small risk associated with administration of general or regional (spinal or epidural) anaesthesia. Major medical complications such as heart attacks, strokes or chest infection are less common. The risk is increased if the patient is older and has multiple medical conditions which may have affected the functions of vital organs such as heart, lung, liver and kidneys. A complete pre anaesthetic assessment will be carried out before surgery to optimise medical condition and minimise the risks associated with anaesthesia and surgery. Infection: Incidence of infection after revision knee replacement is rare but slightly higher than in primary knee replacement. The risk of infection is reduced by administration of prophylactic antibiotics in the perioperative period. Infection may occur in the hospital or after you go home. Superficial infections are usually treated with antibiotics and the deep infections may require washout of wound in addition to administration of antibiotics. Rarely the deep infection may not respond to the antibiotics alone and may require implant removal and reinsertion of implant after some time as a two stage procedure. If you experience any signs of infection in the operated knee such as swelling, redness, excessive pain or discharge from wound, you must contact Mr Samsani or his team for immediate assessment and treatment. Deep Venous Thrombosis and Pulmonary Embolism: Blood clots can occur after revision knee replacement. This risk is reduced by administration blood thinning Injections or tablets after surgery. Other measures such as elevation of legs, TED stockings and calf compression devises are also used to reduce the risk of blood clots. Exercises and early mobilisation after surgery also reduces this risk. Rarely, if not detected and treated properly, a portion of the blood clot can break off and migrate to lungs causing pulmonary embolism (about 0.4%), a serious and life threatening condition. Stiffness: Stiffness of the knee joint can occur after following revision knee replacement. In majority of cases the stiffness improves with physiotherapy and exercises and it can take up to a year after surgery for optimum improvement. Rarely may require manipulation under anaesthesia to reduce the stiffness. Reflex sympathetic dystrophy: It is also called as “complex regional pain syndrome”, a rare condition that can result in the knee becoming painful, stiff and hypersensitive after surgery. Majority of cases respond to non-operative measures and may require specific treatment from a pain specialist. Fracture of thigh and leg bone: fracture of thigh bone or leg bone can occur during the surgery due to poor quality of bone but is very rare. The fractures that occur during surgery are usually treated immediately with wiring or plating. Sometimes knee is splinted in a brace for 6 to 12 weeks after surgery to treat small cracks that occur during surgery. It is very rare to see these fractures after the surgery unless you have been involved in a bad accident. Loosening or malposition of prosthesis: Malposition of prosthesis during surgery can occur. The revision prosthesis may migrate due to poor bone quality or inadequate fixation to bone. Damage to nerves and vessels: Damage to major nerves (tibial and peroneal nerves) around the knee joint is very rare. However it is very common to have an area of numbness over the outside of your knee where a superficial skin nerve is always cut in the skin to perform surgery. This numbness will not affect functional outcome after the operation. Sometimes these nerves get stretched during the operation and may result in temporary paralysis of the affected nerves. Permanent damage to these nerves is very rare. Damage to major vessels is also very rare. Haematoma: Occasionally persistent bleeding into the tissues around the knee joint can result in formation of a haematoma. This may sometimes require surgical drainage. Scarring: Scar may be longer than the first time knee replacement procedure. Scar tends to be thicker in some patients than others and usually does not cause any major problem. Leg swelling: Slight swelling of operated leg and foot is common after the knee operation. It resolves usually with elevation, exercises and time. Immediate postoperative recovery is more or less similar to that of a primary total knee replacement. It consists of pain management, physiotherapy and exercise programme to strengthen muscles of leg, improve the knee range of the movement and also to improve the balance. Rehabilitation is generally more intense and longer than that in primary knee replacement without causing any further damage to the revision prosthesis. - Knee may be supported with a brace or a splint for 6 to 8 weeks. - Weight bearing may be restricted for 6 to 12 weeks after surgery. - Improvement in strength and range of movement can take up to 1 to 2 years. The length of recovery after revision knee replacement varies from patient to patient depending on patient’s general medical condition and the complexity of revision surgery. Despite the complexity of procedure, 90% of the patients achieve good to excellent results after total knee replacement. How to avoid problems after revision knee replacement? Prevention of infection: Infection after revision knee replacement is uncommon. However presence of an active focus of infection in the body can spread the bacteria through the blood steam. These bacteria can then lodge at the knee replacement site and result in infection. Common causes of such infection are urinary tract infections and skin and nail bed infections and must be treated with antibiotics immediately. You must also take prophylactic antibiotics too before any dental procedure to prevent spread of bacteria through blood stream. - Severe pain in the knee at rest and night. Prevention of Blood clot: Blood clots can occur in the legs after revision knee replacement. Early mobilisation and continuation of exercises after operation combined with administration of blood thinning medication reduces the risk of blood clots in legs. You must go to the nearest Emergency Department or a qualified doctor immediately to treat this life threatening condition. How can I protect and prolong the life of my revision knee replacement prosthesis?